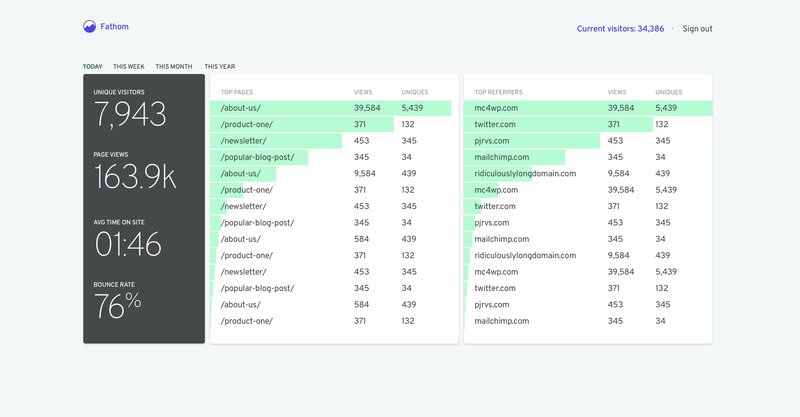 Fathom Analytics provides simple, useful website stats without tracking or storing personal data of your users. Fully-managed on our cloud network. Want to see Fathom Analytics in action, here’s a live demo of our own analytics. Questions? Talk to a founder via email. You can see our roadmap here. As you can see from the above, we’ve made sure our paid offering does so much more for our customers than people who install the open-source version. And, our next version (2.0) will only be available to our paid customers. Even on our paid and hosted version, you still 100% own your data and we won’t lock you into anything (your business is our privilege, not our right). Taking great care of our paying customers is how we stay in business for the long-term. We love open-source and will continue to support 1.0 as a completely free option—digital privacy should be available to anyone who wants it. If you’d like to migrate from our open-source version to our hosted version, we’ve helped many people do this so far and are happy to assist you as well. Contact support.